But guess what? 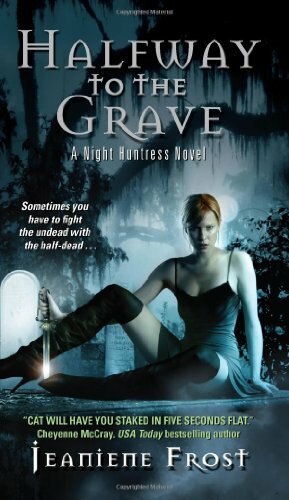 I was so enthralled with this new series (aka “The Night Huntress” novels), that I did not put it down until I got through it (Anita arrived, but had to wait)! This series is action packed, funny AND romantic! It made me laugh out loud numerous times, and captured my attention, so much, that everything (and everyone else) went ignored. Ok, since I am not a “pro” at book reviews, I will do my best to not give out any spoilers (that simply drives me crazy! ), but I can’t guarantee that I will not give away too much info. I will do my best, though! Synopsis: Catherine (aka “Cat” or better yet “Kitten”), was born half vampire (and irritated enough by this fact, that she made it her life mission to kill ALL vampires). She is human enough to be able to eat regular foods, not need blood, and appear fully human, however she is significantly faster, stronger, and heals better, than most humans, allowing her to fare well against some of the vampires she preys upon. After an unfriendly beginning between the two, they eventually fall into some sort of partnership, where he trains her, and helps expand her Vampire abilities, and they become an unstoppable killing vigilante duo (all in the name of justice, of course). They forge a wonderful intense bond, and of course encounter many dilemmas along the way (some of which spill into future books, and make for a GREAT storyline). Let’s just say, I was lucky enough to have gotten into this series when three of its books had already been published. Had I been obliged to wait for the next in the series, after the way the first one ended, I would have gone crazy! This is one. good. book series. I hear there is another one coming out in a few months. I am ready and waiting! Your website has been my guide for the past few weeks. I have read almost 15 books all from your reviews. I just finished this book last night after staying up until 5 am reading it. I could not put it down. This series is by far my favorite so far. Already started on “One Foot In the Grave” and I cannot put it down. Thanks for your great website and amazing reviews. By the way, have you read any of Christopher Moore??? ?